Or, The Vicious, Small-Stakes Politics of the Science Fiction Community. 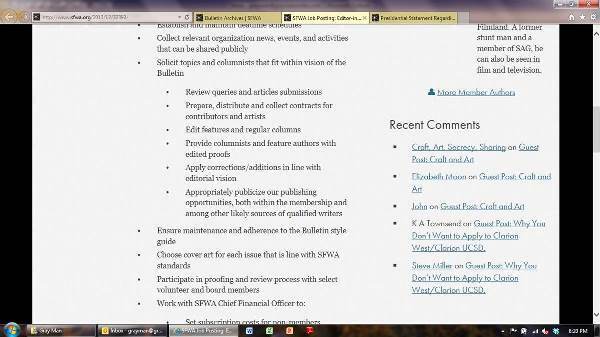 I’ve been watching yet another brouhaha in the Science Fiction and Fantasy Writers of America (SFWA). Or, to be precise, not really another one, more of a continuation of the one from last year involving the editorship of the SFWA Bulletin. I venture to say that SFWA politics also involve relatively small stakes, and the vitriol expended on them is far out of proportion to the issues. Which brings me for the moment to the exception I alluded to above, viz., the tendency to resort to ad hominem attacks instead of addressing the issues. It’s at least understandable in electoral politics, where scoring points may rally the base or shake up an opponent, and where the stakes are higher because the issues involve nontrivial impacts on people’s lives. Scoring points that way can even be amusing, if done with panache. But it’s usually unnecessary if one has a principled position to defend and a sound argument based on valid premises. Unfortunately, in these SFWA proceedings I detect much more inflammatory rhetoric than reasoned argument or entertainment. Perhaps I should not be too surprised: after all, writers are in the business of producing dramatic works. But unwarranted personal attacks raise my hackles, especially when directed at friends of mine; and I count as friends people all along the conservative-liberal spectrum, with whom I will stand when they are attacked even if I disagree with them on any particular matter under debate. I submit that, even if true, that really doesn’t matter anymore. The statement itself seems contrary to the Bulletin editor job advertisement — seen below in a screenshot taken yesterday — which reads that the editor will “Participate in [the] proofing and review process with select volunteer and board members.” But even if that enigmatic item does not refer to an editorial review board, it doesn’t matter because the idea of the Bulletin editor having much in the way of autonomy evaporated with the dismissal of the previous editor over the “warrior woman” cover and the Resnick-Malzberg historical article that violated an unwritten, unspoken taboo by noting a female editor’s attractiveness. So came the latest brouhaha: some members and nonmembers signed a petition expressing concern over the editorial board notion, which if formed would only institutionalize the weakened position of the editor. And their petition was met, as such things often are, not with thoughtful objections but with scorn, ridicule, and anger. None of which will make much difference in the long run, because the castle keep of editorial (and authorial) license was stormed last year and now lies in rubble. All of this seems to me clear examples of the viciousness of organizational politics over stakes that are pretty trivial. Comments Off on Look at How Many of My Friends are on the Nebula Awards Ballot! Foreshadows: The Ghost of Zero is an ambitious multi-media project combining original music, original fiction, and original artwork. Jeff, his brother, and several others collaborated on it, and the end result is very impressive. I haven’t read many of the stories yet, but I’ve listened to all the music and it’s very evocative. (I admit that I’m not a big fan of “techno” and much of this music is of that style, but in terms of conveying the emotional undertones of the stories I think it works well.) My favorite of the songs is “Made in Brazil | Living in Japan.” The artwork, too, is extremely well done. Check it out at http://foreshadows.net/! Fifty years ago today — November 29, 1961 — NASA launched the last “orbital qualification flight” for the Mercury program. 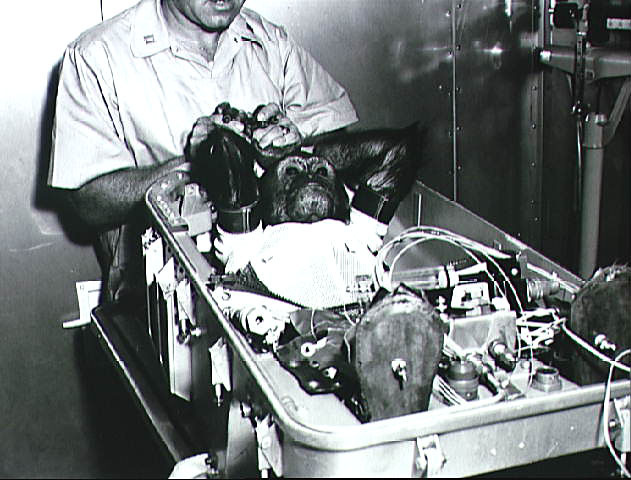 Mission Mercury-Atlas 5 carried a chimpanzee, Enos, that “performed various psychomotor activities during the flight and was found to be in excellent physical condition following splashdown.” Enos was supposed to make three orbits around the Earth, but mission controllers brought him back after only two orbits because of a propulsion system problem. As for the writer chimp, that would be me. Usually, when it comes to literary primates, I think about hypothetical monkeys at typewriters, trying to produce Shakespeare; you too may be familiar with the infinite monkey theorem. * But monkeys have tails, and we already have Shakespeare, so I’ll live with the chimp metaphor. Anyway, yesterday marked another metaphorical milestone for me in terms of my writing career, such as it is: I sent in my contracts — and, perhaps more important, my money — to upgrade to “Active” membership in the Science Fiction & Fantasy Writers of America. Soon, then, even though my fiction doesn’t come close to paying the bills, I may be considered a “professional” writer. *An even more entertaining Wikipedia entry: the infinite monkey theorem in popular culture. If you’re a member of Renovation, this year’s World Science Fiction Convention, or were a member of last year’s AussieCon, and you haven’t submitted your nominations for the 2011 Hugo Awards, you don’t have much time left! The last day to nominate anything is tomorrow. I submitted my nominations this afternoon. I probably should’ve been reading slush, but that’s the way it goes. With respect to the nomination process, I’ve decided I need to develop a system whereby I mark and set aside good stories throughout the year, instead of going through the stack of last year’s magazines (on paper and online) and books and trying to remember which ones I really liked. With respect to the nominations themselves: just in case any of my family and friends thought I might give in to the temptation, I did not nominate myself for a Hugo, nor did I nominate myself for the John W. Campbell Award for Best New Writer. Finally, on a related note: Mary Robinette Kowal, winner of the 2008 Campbell Award and the current Vice President of the Science Fiction and Fantasy Writers of America, mentioned me in her blog entry this past Tuesday: Campbell Award Eligible Writers You Should Pay Attention To. Thanks, Mary!